The third in a series of gorgeous new Swiss franc bank notes will be released by the Swiss National Bank (SNB) on October 18th. The 10-franc note keeps its yellow colour, but most everything else in the design and construction is different. What’s most remarkable about the new bank note? Not the 40 centimes or so it takes to make each note, nor that each note is projected to last only about a year. Not the sophisticated security measures, including multiple layers of transparent and inked polymers, paper and other materials, plus other features embedded to combat counterfeiting – all this is done in Zürich by Orell Füssli. Most remarkable is what this note, like the rest of the new series, does not have. Swiss francs, like most world currencies, have long featured notable faces from the past. But now, each beautiful note is designed around an abstract theme related to Switzerland. 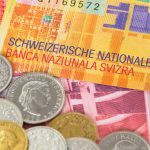 For the 10-franc note, instead of the retired portrait of the controversial genius Le Corbusier, the theme “focuses on Switzerland’s organizational talent – expressed by time”, says the SNB. On one side it has a pair of hands conducting an orchestra, a globe showing time zones, tiny clock faces, and nearly microscopic graphics celebrating the punctual Swiss rail system. The first of the new Swiss franc notes to be released was the 50-franc note. Its theme is wind. It won an international competition as best new bank note of 2016. Then came the 20-franc note, designed around the theme of light. Tying together the designs of all the new Swiss franc notes is the human hand. On the 50-franc note, the hand holds a dandelion, its seeds scattering in a puff. The hand on the 20-franc note holds a prism refracting light. The 10-franc note shows an orchestra conductor’s hands keeping time with her baton. But are those a woman’s hands? What about the hands on the 50-franc note and 20-franc note? Are they a man’s or a woman’s hand? “It’s a secret”, says Manuela Pfrunder, with a laugh. Pfrunder designed all the notes. “There are six bank notes. We had six different models”, she says. Some were men, some women. The hand art on the notes is true to the models’ actual hands. Was she one of the hand models? Pfrunder won’t say – but don’t these long fingers (below) look a little like those on the 10-franc note? 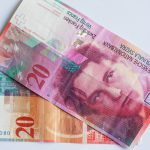 Anyone in Switzerland can take a closer look on October 18th, when the new notes begin their release.